Do you want your dog to be a social butterfly? Here’s 7 ways to help them! Many pets can be shy, whether it is due to their personality or just an environmental trigger. If you want to make your pup feel more comfortable around others and be less fearful, here’s some ideas you can try. 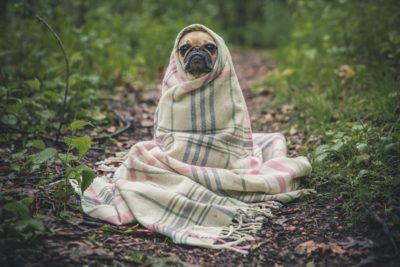 Many dogs have anxiety because their environment is always sheltered. They stay in the house (except for potty breaks) and only interact with you and other family members in the household. So when someone else comes over, it’s like their world changed…in fact it did. One of the best ways to get your dog to open up to the world and be more sociable is to give him/her the opportunity to see that new people, smells and sounds are all a good thing. Schedule some regular check-ins with your friends and even your neighbors. They don’t have to stay long, but long enough to let your dog see that they are not a threat and that socialization is a good thing. Let your dog get used to new people in his/her own environment and you’ll see them open up more. Of course if you’re going to invite people into your household for your pooch to get familiar with, eventually you can try the same thing with other dogs. First, make sure you’re educated on the proper way to introduce dogs. HINT: It’s NOT by just bringing a new dog inside. You’re invading their territory and actually vastly increasing their stress. Instead, take your dog on a walk where you happen to meet the other person with their dog. Here’s the key, you want to walk together as a team so the dogs get to feel like a part of the pack. Then, when you return to your home, make sure to let the visiting dog into the house first. In dog speak this helps to establish the pecking order within the pack. If you slowly follow this process with other dogs in your neighborhood or within your circle of friends, you’ll start to educate your own dog that new animals can be a good thing. Once your pup is ready for an extra adventure, you can expand their environment (and universe) by bringing them on a field trip to a neighbor, family member or friend’s house. Dogs need mental stimulation and what better way to get that then by experiencing the sights and sounds of a new house. Remember that a dog’s sense of smell is 2,000 times more powerful than a human so even just the smell within the air at your friends house can be dramatically different and stimulating. 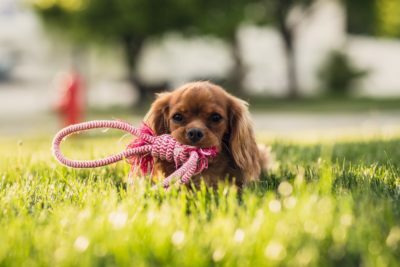 When you’re trying out a new house it’s best if you do it in small doses and keep your pooch on a leash so that you can be monitoring their exploration. Not everyone’s households have been dog proofed and you don’t want your furry friend to get into something they shouldn’t. If you’re trying to get your dog to become the social butterfly of the neighborhood, people will often tell you to cut them loose and let them make friends. This is one of those bad ideas. Other dogs make not take so kindly to your pooch running full speed towards them and they can often interpret that as a threat. When meeting new animals, always meet outside and make sure both are on a leash. Don’t let the animals go nose to nose but rather let them smell from opposite sides of two people (imagine you two standing side by side with the dogs on the outside). Then engage in walking the same direction. Dogs are pack animals, they’ll quickly get the idea that we’re all part of the same pack. 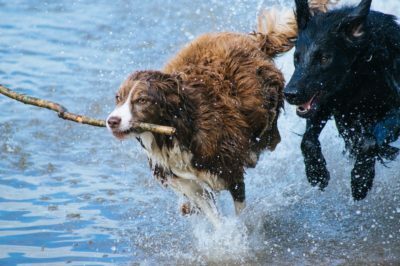 To keep building on the socialization aspect for your dog, you’ll want to vary the types of people they encounter. If everyone is like you, try and find some younger and older folks to mix things up. Always be aware of young children particularly if your dog has no experience with them. Kids often do not understand that puppy doesn’t want his ears pulled like drapery ropes. Older people can be a great source of variety as well. And added bonus, you get to make some new friends! Making your dog feel more comfortable in their own skin can also be accomplished through some basic canine manner training. Make sure you’re only working with positive reinforcement trainers. No smacks across the snout here. Positive training reinforces with your dog that doing good brings treats and praise. When your dog feels more confident that they are pleasing you and are a part of your pack, they’ll be happier and more ready to engage with others. Training offers your dog confidence and will make your pooch feel more in control. Dogs want mental stimulation just like you or I do. But they don’t get it from watching television or Netflix. Games like fetch help a dog relax and have fun! Engage in thinking games with your pet to help them experience life the way it was meant to be, full of fun and surprises. Have you had success with socializing your dog? Let us know what worked for you!